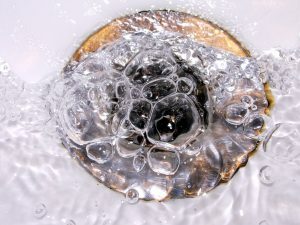 The first thing that many homeowners do when a drain develops a clog is reach other the sink for a bottle of liquid drain cleaner they bought at the hardware store. If you’re one of these homeowners, we urge you to stop this. In fact, we urge you to avoid using store-bought solutions all together if you have any hopes of keeping your drain pipes in good shape. Unsure of how to relieve clogs drains if you can’t use these solutions? Read on for 4 things you should know about professional Bergen County drain cleaning. Winter means holiday guests, which makes it a busy time of year for plumbers. All those people using the various appliances and fixtures in your home adds a lot of strain. A larger reason for those clogs, though, is all that extra cooking you may be doing, and all of the plates scraped into the garbage disposal. 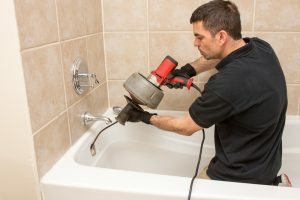 There are steps you should take to prevent the hassle and cost of drain clogs, such as limiting the fats, oils, and grease that go down the kitchen drains and keeping hair traps in the bathroom drains. Thankfully, when trouble does arise from the drains, professional plumbers have the tools and know-how to unclog the drains quickly. Here in Hillsdale, NJ, problems with your sewer line used to mean big trouble. The damage itself – whether a clog, a leak or general corrosion – wasn’t all that difficult to repair, but getting to the problem area could be a major hassle. You needed to dig down to it, which meant expensive construction equipment and longer man hours, then cover it up again when the repairs or replacement had been made. That became doubly problematic in the winter, when the ground was frozen, and even when it all went according to plan, you were left with a devastated yard that needed major work to look presentable again. IS MY SEWER LINE LEAKING? A sewer line leak used to be big trouble here in Dumont, NJ, especially in the winter when the ground was frozen. Unearthing it meant time and effort, which entailed a lot of added expenses too. Nowadays, we can solve the problem much more quickly and inexpensively with trenchless technology, but you still need to be able to spot the signs of a sewer leak in your home. Otherwise, you won’t summon the proper help and the leak will continue: costing you money and damages in the process. Here’s a quick list of a few ways to tell if your sewer line is leaking. If you spot them., your best bet is to call in a trained professional who can assess the situation and help you determine the best way to resolve it. Posted in Drain and Sewer | Comments Off on IS MY SEWER LINE LEAKING? There are two main lines that help with your home’s entire plumbing system: the main water line, which brings in potable water for use, and the sewer or septic line, which carries away waste and wastewater. These lines are entrenched in your yard, so knowing when a problem develops with them can be a little tough to decipher. Today we’re going to give you some signs of which to be aware of in case it’s time to replace your sewer line in Bergen County, NJ. Whenever someone mentions a plumbing problem with a main plumbing line like a sewer or septic line, images of a ripped up lawn pretty instantly come to mind. This is because many times, the process of finding an issue with a main water line or sewer line involved unearthing the entire pipe. But when video pipe inspection is used, your plumber will be able to see the innards of your piping without digging up a single speck of dirt. Video pipe inspection in Dumont isn’t used just in cases of repair; it can also be used as a great maintenance tool. Why? A video pipe inspection allows your plumber to get a bird’s eye view of the inside of your pipes, so if there are any blockages, damage or corrosion, these problems will be spotted before they can cause big problems for your home. How does video pipe inspection work? Let’s take a look. When a professional plumber uses video to inspect your pipes, it may not look like he has a camera at all; this is because thanks to fiber optics, the cameras are very small and are attached to cables that are very similar to the same kinds of cables used to snake drains. And in fact, this is what the plumber is going to do: snake the video camera through your pipes to get a full look at what’s going on. The cameras used for video pipe inspection are high resolution, so the picture that your plumber sees on the monitor is very clear and detailed. The images are viewed in real time and can also be saved, and many cameras also include radio transmitters that allow measuring between the camera’s location and the surface. With video pipe inspection, your plumber can pinpoint the exact location of a problem within a pipe, eliminating guesswork and the need to rip up a floor or your yard in an effort to find a blockage or leak. This makes the entire process less invasive and cumbersome for both plumber and homeowner alike. It also makes repair and maintenance work more efficient and less time consuming, which can save you money. If you have concerns about a block in your plumbing system, or simply want a thorough check of the system, call the experts at BZ Dependable Plumbing & Heating, Inc., today and schedule an appointment for video pipe inspection. As you may know, using over-the-counter chemical drain cleaners is a big no-no for your plumbing system. These types of cleaners are very caustic, rarely resolve your drain’s clog as needed, and may actually do damage to your plumbing instead. But there is one OTC product you can buy to clean your drains in Fair Lawn effectively and naturally: BioSmart drain treatment. BioSmart drain treatment is a 100% natural drain cleaner made from vegetative microbes; as such, “good” bacteria and enzymes are part of the treatment’s patented formulation. Bacteria and enzymes feed on organic waste like fats, oil and grease (FOG), food particles and soap scum, which are typically the top reasons for slow draining and clogs. BioSmart will even breakdown hair over time, but more importantly, it eats away at the build-up that holds hair in a clog, allowing it to wash out of your system. BioSmart comes in two forms: liquid and powder. The liquid form doesn’t require any mixing and is safe for septic use; the power form of BioSmart has the same power as the liquid, but is good for those who don’t like to use liquid or those who have had a sewage spills. The most obvious reason to use BioSmart is to clean your drains both effectively and naturally. No one likes the idea of putting harsh chemicals into their plumbing system, and BioSmart allows you to clean your drains without this worry. Second, the effects of BioSmart last for weeks because of the organic material used: the bacteria and enzymes not only clean your pipes, they also coat them. This action allows the micro-organisms to eat away at sink waste before it can form a new layer of build-up. Lastly, BioSmart is cost effective: the treatment is very inexpensive compared to a mechanical drain cleaning and it can help prevent future clogging. Contact BZ Dependable Plumbing & Heating, Inc., today and schedule an appointment with one of our drain cleaning experts.